I’ve always dreamed of having a house full of kids laughing, playing and running around. And this last Saturday, I got a tiny little glimpse of that dream and it was so heavenly! You see, we were watching a sweet little girl (Bubbers’ first kiss) and it was a gloriously beautiful day. So I suggested we take the kids out back and enjoy the sunshine. Charming helped me get their shoes on and we went out to the backyard. 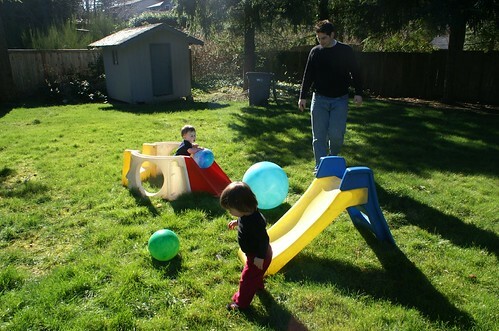 Then I suddenly remembered I’d just bought Bubbers some yard toys (early birthday presents–thank you, Craigslist!). So I asked Charming to get them out of the back garage, along with some bouncy balls we’d forgotten about. I looked up and saw this. And my mother heart filled to the brim and overflowed with happiness to see beautiful children playing in my backyard! I smiled the biggest smile and right then I knew exactly what heaven felt like. No doubt about it, having your first child is immeasurably special. You get to have so much one-on-one and all the time in the world to figure things out together. 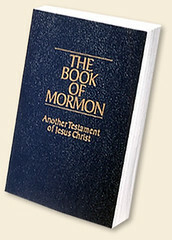 Its a whole new world. But having number two is a completely special too, and the experience has its own kind of specialness. We felt like a family before Grant, but now we feel like we are really parents. Its hard to explain, but the feeling of it is why you took those pictures. Does that make sense? So… are you guys planning on doubling your ranks, or what? Sorry, that was a little personal. How sweet! It sure was fun. And you definitely have a mother heart. Jesse: That is so interesting to me what you said: “We felt like a family before Grant, but now we feel like we are really parents.” Because often I sit back and look at Bubbers and think, “I love Bubbers and I’m so glad we have him,” but I can’t shake the feeling that he’s not all there is–that our family isn’t complete. Does that make sense? Charming: Thank you, Love–I take that as the highest compliment! I love Sister Beck. 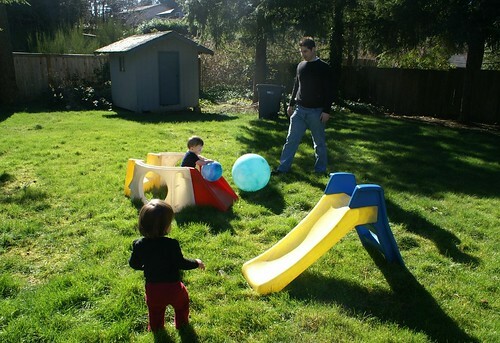 I feel the same way as you… that’s so fun to have kids playing in the backyard! You are definitely going to be the best mom as your kids are growing up! When I was a kid I swore I was never going to get married, or if I did I wouldn’t have kids. I’ve obviously changed my stance since then, but I sometimes struggle with it on bad days. My mom wasn’t a stay-at-home mom (out of necessity!) she was a great mom, but sometimes I want to rebel and I feel like I don’t really know what I’m doing! By the way, I love the back lighting in your pics…thats my favorite kind of lighting. ps which house is that at? Tearese: Thank you, Tearese–what a kind thing to say! That’s so interesting to me that you used to swear you wouldn’t get married and have kids. After a couple rough relationships, I was starting to question whether I wanted to get married. But I knew I still wanted to have kids, so I wasn’t sure how that was going to work… Then fortunately, I met Prince Charming, who re-instilled my faith in men and relationships and was the best decision I ever made. This is our old (current) house. We hope to be in our new one in a couple weeks. I have a similar dream. Only I’m not as close to realizing as you, in one aspect. No backyard, although I would love to have one. I do have 2 kids however which at least gets me closer to having kids playing around all the time. It’s just inside. Oh well, just another downside to apartment living. One of these years, maybe we will have a house.